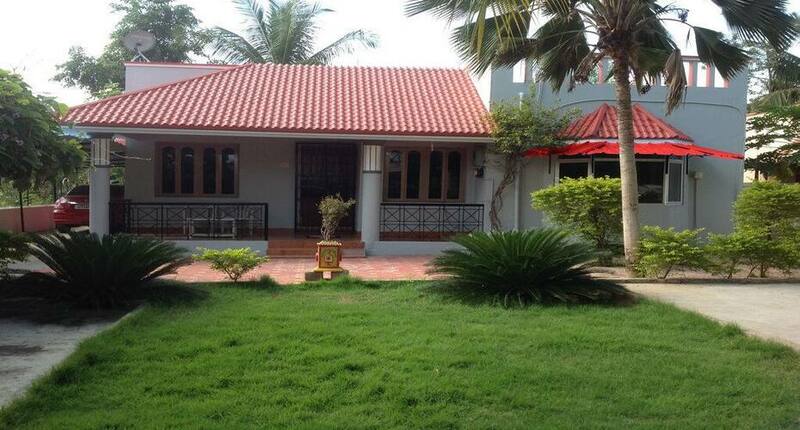 PROPERTY DETAILSTirupati Homestay is a value for money accommodation in Tirupati, offering comfortable stay along with value added services such as complimentary Wi-Fi access and pure vegetarian breakfast service. The property has a spacious living area with sofa set and center table, well-equipped kitchenette, well-maintained garden with sit-out and swing set and walking area. A total of 3 air-conditioned rooms are available for accommodation. Rooms are equipped with requisites such as LED television, filtered drinking water, and attached bathroom with 24-hour hot and cold water facility. Tour/travel assistance with pick-up/drop facility and laundry service are a few of the conveniences provided. Guests can also avail of vegetarian meals on prior request and at a surcharge. NEIGHBORHOODPlaces worth visiting include Padmavathi Temple Garden (2 km), Regional Science Center (9 km), Sri Venkateswara Zoological Park (15 km), Mallimadugu Reservior (22 km), PachikaPallam (26 km) and Sri Venkateswara National Park (28 km).NEARBYThis Tirupati homestay is reachable via travel hubs such as Tirupati Central Bus Station (4 km), Tirupati Railway Station (4 km) and Tirupati Airport (17 km). One can find convenience stores, market area, ATM, police station, and multiple eateries within a range of 2 km. HOUSE RULESTimings: Check-in and check-out: 10 am. Smoking and drinking are not permitted within the premises. Accommodation is mainly offered to families and groups with valid ID proof. Independent house with very clean rooms, furniture and facilities. Located close to Tirupati town. Very comfortable for stay for large families. Two bedrooms with AC and play area outside for children. Car parking available. Excellent and recommended. It is a pleasent place. It is good to stay here. The place is quite famous among people. Most people prefer to have stayed here. Food service provided by them is amaizing and tasty. Room se5is also good. Came for a visit to the famous balaji temple, stayed for a night and breakfast. Ravi and Sridevi are great people running the homestay. They took my feedbacks on housekeeping with due attention. Breakfast was hot idli and vada. Visit if you wish to have a homely sample bed and breakfast kind of a place when you come to visit the Lord. We were in Tirupati for a wedding and decided to book this homestay. The hosts were very friendly and accommodating. Very nice place, well located, secluded from the rest of the city. We wanted a peaceful place, and this was the best. For once I even thought of asking if they would like to sell this place :) just kidding. It is one of those places where you feel like you're home. It is a lovely individual home not a hotel.